Golf provides the lure of escape. When players are immersed in their game, the cares and worries of the real world take on far less prominence, almost as if they don’t exist. On some occasions, however, one will be reminded that even the most noteworthy golf accomplishments pale by comparison to what is occurring elsewhere. Michael D’Antonio goes far to support this observation in Tour ‘72 (Hyperion; $24.95 SRP). This fascinating book studies four golfers whose influence on the modern game is hard to overstate. He chose 1972, a remarkable year in golf and otherwise, to recount the combined accomplishments of Arnold Palmer, Jack Nicklaus, Lee Trevino, and Gary Player. The coverage of the 1972 season begins with Lee Trevino’s struggle to reconcile his own self-image with the cover on Sports Illustrated. He’d just been named the Sportsman of the Year for his stunning performances in 1971. Some of Trevino’s personal travails, however, also hint at the similar social disconnect between most of professional golf and the tumult of the late 1960’s and early 1970’s. In this respect, D’Antonio performs a worthy service for those with a diminished sense of history from the last thirty years. As David Frum points out so well in How We Got Here (Basic Books), the 1970’s were a tremendous influence on the current social milieu of this country. D’Antonio makes a similar point, with a particular focus on golf. For example, the segments on Gary Player also describe his relationship with Lee Elder, a leading pioneer among African-American PGA Tour pros. Player experienced his own metamorphosis concerning the role of race in his South African society. Even as he changed personally, however, his fame carried with it the fact of death threats and organized protests over his very presence at American tournaments. The uproar continued despite Player’s own efforts to integrate his country, including the unprecedented act of bringing Elder to Africa to compete. Despite the racial tensions, Player had a reputation as a great golfer to uphold. D’Antonio’s recounting of “The Shot” at the PGA Championship that year shows how he met his goal. Trevino was himself something of a model, not only for those of modest means, but also those from cultures far different than the stereotypical country club set that allegedly filled the ranks of the PGA Tour. He didn’t seek the role, but he understood how it could actually help his game, by creating his own set of adoring fans. He found friends in places he didn’t originally expect, as illustrated by the retelling of his British Open triumph that year. Jack Nicklaus, on the other hand, had by 1972 already developed his well-deserved reputation as the premier golfer of his time. Even so, he had his vulnerabilities. Competitors like Trevino, Player, Palmer, and others such as Tom Weiskopf were ready to pounce on any misstep. 1972 was the year that many people felt was Nicklaus’ time to sweep all four majors. That meant he not only had to play well, but that others had to quiver and fall before his inevitable victories were assured. It was a familiar formula for success, and it worked in that year’s Masters and the U.S. Open, which D’Antonio describes well. Other history was being made during Nicklaus’ run at the major sweep, of course, from the assassination attempt on Governor George Wallace to the Watergate break-in. D’Antonio shows how these significant non-golf events were either noted or ignored on the Tour. Through all the turmoil, the King remained the most famous golfer in the PGA. Arnold Palmer’s own 1972 record turned out to be unique compared to the prior 15 years on the national golfing stage. It was the first extended sign of his inevitable decline from the pinnacle of golf as a competitor, while he remained a popular fixture for the post-WWII generation. This book is a fine history of an important year, in golf and otherwise. D’Antonio created a compelling story about these four legends of golf in their prime, and the world in which they competed so successfully. 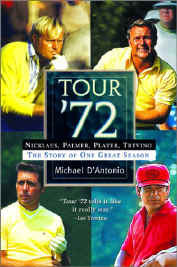 Tour ’72 is a valuable addition to the history of the sport. The Prelude introduces the reader to the four men, with brief outlines of how they came to such prominence by 1972. It will be familiar to readers steeped in golf history, and fascinating to those whose golfing knowledge is limited to the Tiger Woods era. Nonetheless, some aspects of the real world couldn’t be brushed aside. D’Antonio proves this point by also focusing attention on some of the journeyman golfers of the time, including Vietnam veteran Buddy Allin. The short-hitting but accurate professional’s own history during this time, both on and off the course, serves as a useful counterpoint to the exploits of his more famous competitors. That doesn’t mean that what occurs in a golf tournament is without any importance. It simply means that no matter what happens in golf, no matter who’s playing, the real world will nonetheless make its influence felt.